Free two-day event offers beer sampling, food, music, cash prizes and a good time for hard-working beer professionals. 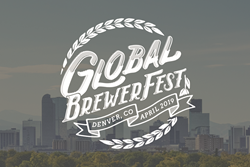 The first ever Global BrewerFest will make its debut opposite the Colorado Convention Center during The Craft Brewers Conference on April 9th and 10th, 2019 beginning at 11 am. The Global BrewerFest is a free two-day event for beer industry members to discover how to reach new markets and expand their existing business, through a fun and interactive experience. The Global BrewerFest is presented by Global Keg, the worldwide leader in Keg Rental and Smart Logistics. “As an industry disruptor, we take pride in changing things for the better and following a path of continuous improvement in everything we do, from Global Keg’s proprietary, industry-leading tracking technology to our beer packaging sustainability initiatives, customer service levels and colorful trade show events. We do things in ways that the industry hasn’t seen before,” stated Global Keg’s Founder and CEO, Bobby “Bob” Moore. The event brings a unique dynamic and international presence to an otherwise domestically focused craft beer industry event. The Global BrewerFest provides a fun-first experience for brewers and lets them sample an interesting variety of global brews and learn how Global Keg can help expand their business in new markets. The Global BrewerFest event will also feature Life Is Better Rescue, a local non-profit animal rescue to help in their fund-raising efforts. The Colorado-based 501(c)3 organization is dedicated to helping rehabilitate and foster shelter dogs like St. Bernards; real-life versions of Global Keg’s mascot, Cooper. Life Is Better Rescue will be Global Keg’s guests at the event, and Global BrewerFest attendees are encouraged to donate to their cause to help provide care for these animals while they await adoption. The Global BrewerFest is open to all brewers attending the Craft Brewers Conference and specially invited guests. Admission is free with registration. Space and supplies are limited, so registration is a must for this event. Global Keg is the worldwide leader in asset rental and reverse logistics for breweries. Global Keg introduced RFID tracking to the beer industry in the form of their SmartKeg™ and SmartPallet™ rentals to eliminate keg liability for brewers, while their SmartReturn™ reverse logistics service is also revolutionizing the draft beer supply chain for the better. Global Keg’s Smart Technology delivers maximum efficiency and guarantees more working capital, time and resources for all its customers. SmartKeg™ rentals are the most sustainable kegs available for draft distribution. Global Keg solves the problems that come hand-in-hand with keg ownership by guaranteeing clean, ‘Fit-For-Use’ barrels when and where they’re needed; Anywhere in the world. With SmartKeg™ technology, brewers benefit from advanced logistics services, zero keg liability and risk-free shipments of their beer to new markets. Breweries can now eliminate keg deposits, lost keg fees and keg pickups, while better preserving the quality and freshness of their brews. Global Keg currently services 5 continents, 40 countries, and more than 500 cities and counting around the globe.